Today I want to write about a cute little bird that has beady eyes, the elf owl. These tiny owls only grow to less than 15 cm tall and are the lightest species of owl in the world. Because they are so small, so is their prey, eating scorpions, moths, crickets, centipedes and spiders. Like most owls, they have excellent night vision and such great hearing that they can catch insects in flight in complete darkness. When threatened, elf owls play dead until the threat has passed. 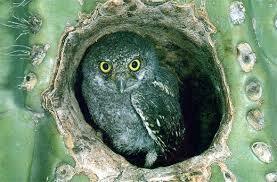 At breeding time, females lay 2-4 eggs in holes that have been made by woodpeckers in large cacti and trees. Elf owls are found in forests and desert areas in the south-western United States and Mexico. They sometimes migrate further south during the winter months. Are there any other interesting facts that you would like to share about elf owls? They do not have ear tufts, unlike the great horned owl.